Dr. Sanjay K. Khurana, board certified adult and pediatric spine surgeon, is launching a new site for his practice in Los Angeles. With LAspineGroup.com, our goal is to provide patients with a resource for the most effective and modern treatment options for spinal injury and trauma. Award-winning orthopedic spine surgeon Sanjay K. Khurana, MD, is proud to announce the launch of a LAspineGroup.com, a new website for his practice in Los Angeles. 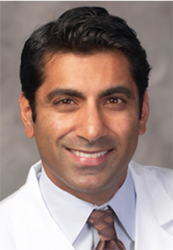 An expert in minimally invasive procedures and correction of formerly failed back surgeries, Dr. Khurana believes that his new website will be an industry hub of information on cutting-edge spine surgery techniques and procedures. Recognized as an industry leader in XLIF (eXtreme Lateral Interbody Fusion) and other minimally invasive surgical procedures for common and complex spine conditions, Dr. Khurana has performed over 3000 surgeries ranging the entire axis of the spine. Dr. Khurana focuses on compassionate care for adult and pediatric conditions and has been recognized with several awards by his peers and patients alike, including Super Doctors and the Volvo Research Award. At LAspineGroup.com, patients can find the latest information on new and innovative spine surgery treatments, read patient testimonials, and learn more about the cutting-edge procedures performed by Dr. Khurana and the staff at Los Angeles Spine Group. As a hub of information for various spine procedures, patients can learn more about minimally invasive spine surgery, artificial disc replacement, kyphosis correction, and many other treatment techniques at LAspineGroup.com. With valuable information in regards to spine conditions and treatment options, Dr. Khurana’s website is a helpful source for patients suffering from back pain and various spine conditions. Dr. Sanjay Khurana is a board certified and fellowship trained pediatric and adult orthopedic spine surgeon in Los Angeles. He specializes in minimally invasive and robotic spine surgery procedures with an emphasis on degenerative disc disease, herniated disc, spinal stenosis, scoliosis and spinal deformity, spinal instability, spine trauma, spine tumors and spondylolisthesis. Dr. Khurana completed his undergraduate degree at the University of California at Berkeley and his medical school and orthopedic surgery residency at The Stanford University School of Medicine. Dr. Khurana completed his combined orthopedic and neurosurgical training at the prestigious University of Miami / Jackson Memorial spine fellowship under the mentorship of Dr. Frank Eismont and Dr. Barth Green. To learn more about Dr. Sanjay Khurana, please call 310.574.0400 or visit http://www.laspinegroup.com.